So what exactly do you have to do to convert a communications antenna into a radio telescope? Today, Lewis Woodburn at the Auckland University of Technology and a few pals, answer this question by detailing the process they have gone through to make the conversion. The old satellite communications dish in question was built in 1984 for the New Zealand Post Office and transferred to Telecom New Zealand in 1987. 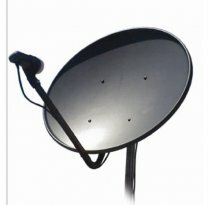 By 2010, the dish had become obsolete and the company stopped maintenance with the intention of demolishing it. That’s when the Auckland University of Technology stepped in. What they inherited was a far cry from a state-of-the-art radio telescope. The dish is located near a remote township in the very north of New Zealand’s North Island. Being only five kilometers from the sea, salt corrosion was significant issue, particularly given the lack of recent maintenance. So the team’s first task was to clean the dish service and replace rusty bolts and equipment. In particular, the motors that move the dish had become rusted and in any case were old and inefficient. What’s more, the dish’s pointing mechanism allowed the dish to travel through only ±170° compared with the ±270° required for radio astronomy. So the power cables and metal chain that did all this steering also had to be replaced with the longer ones to allow for this extra movement. The dish also required new emergency stop circuits to prevent the dish moving beyond its mechanical limits. Next, the team looked at the dish’s control system. Originally, the antenna had a pair of large induction motors for slewing and a set of small DC servomotors with extra gearing for tracking the small daily motions of geostationary satellites. The team replaced both sets of motors with a single set of DC servomotors with optical shaft encoders that work both for slewing and tracking.